Cycling was very popular during the Victorian period, both as a means of transport and as a healthy and liberating form of exercise. Young working men were encouraged to save their wages and to buy their own cycles so that they could become independent and mobile. Their bikes were a source of great pride and would have been cared for lovingly with much time spend polishing them and repairing minor damage. 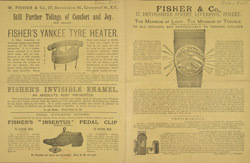 Bicycle shops like Fisher & Co., advertised on this leaflet sold polish, spare parts and cycling accessories like lamps and ‘tire heaters’.